Abacus, will be offering free information at Kidz to Adultz North that assists with grant applications (Stand B14, EventCity, Manchester, 17 November). Abacus powered baths provide greater safety, accessibility and comfort for disabled bathers and ensure carers can support at safe working heights. These hi-lo baths with and without bather transfer seats and integrated platforms provide a more pleasant and relaxing bathing experience. Moving and handling risks are reduced as manual transfers in and out of the bath can be eliminated. Despite these baths being regarded as ‘necessary and appropriate’ for many families by Occupational Therapists, funding via a Disabled Facilities Grant (DFG) can regularly be rejected by local authorities. This can commonly be based on the perception that provision of a wet room or showering adaptations is more cost effective and that ownership of an assisted bath is not essential – in many situations this is not the case. 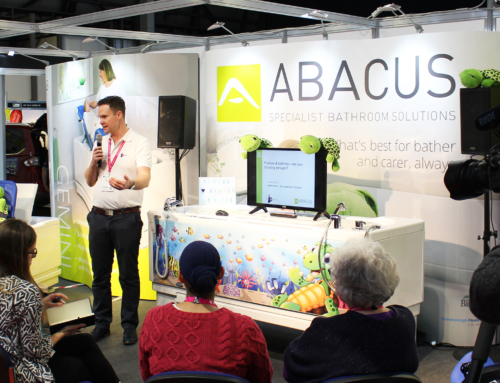 Abacus Product Specialists will also be available throughout the show demonstrating the popular Gemini and Aries powered baths. The height adjustable Gemini is a leading choice for families with disabled children as it includes an integrated changing, drying and bathing platform. This in-built surface negates the need to manually lower and raise a child in and out of the bath whilst the number of transfers can be reduced. This helps to keep the bather warm and comfortable during the changing and drying process and also eliminates potential back injury for carers as excessive bending and lifting is avoided. Alongside the Gemini, the compact Aries will also be demonstrated at Kidz North. The Aries is a hi-lo bath ideal for use with ceiling track or mobile hoists and is compatible with the proven range of Abacus postural supports.